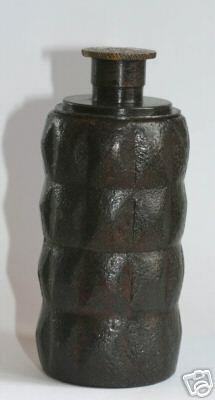 The No.13 "Pitcher" grenade was made of a prefragmented cast iron body. 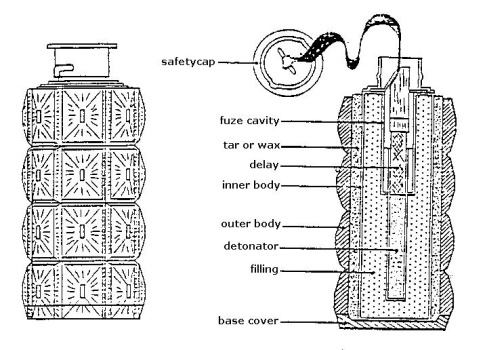 A charge was inserted from the top and fixed with tar. It had a pull-ribbon under the safetycap which was treated with red phosphor and ran through a matchhead compound. Together with the No.14 (similar, heavier) these were the most dangerous of them all. A lot of these grenades exploded immediately when the ribbon was pulled. Weight 510gram including 113gram ammonal. 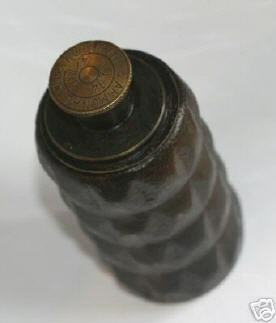 The grenade on the photo below carries the markings "ROBURITE & AMMONAL LTD No14 4/1915"on the safety cap. 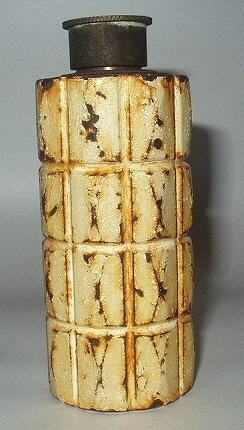 This shows the "drill" version, painted white.